If you do not understand high-voltage safety procedures do not attempt to build a tube amplifier. The RF deck is made very simply from sheet aluminium panels and 15mm angle aluminium. The panels are held together with aluminium rivets, or if they need to be unscrewed, using aluminium Nutserts. I bought my Nutserts from ebay, they are much better than using self-tapping screws in aluminium. The special tool for installing them is quite expensive but I found that I could squeeze them up in a vice. After a little practice on a piece of scrap aluminium it was easy to judge how much pressure to apply. The plate line is a grounded 1/4 wave and tuned with a home-made variable capacitor. A vertical stator is attached to the line using 4 screws. The capacitance is varied using a cam bearing on a springy brass rotor screwed to the chassis floor. Although I have made the CAM from 20mm PTFE round bar, other materials would probably work fine. 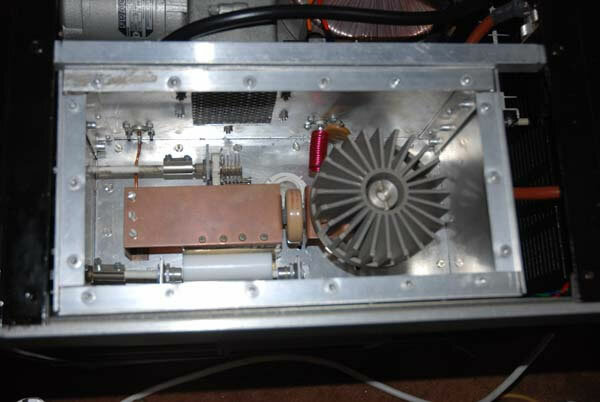 There is a reduction drive on the shaft which comes out of the front panel. The plate line capacitor is a 500pF, 6kV transmitting type. Since taking the picture I have improved the HT decoupling and relaced the 6kV disc ceramic with a second doorknob capacitor. Several people have emailed me asking for the dimensions of the anode line. I don't know. I have never managed to make a VHFamplifier work by just following someone else's dimensions. Although they are a good starting point, I have always had to tweak plate circuits to make them resonant. So I first made the anode line too long. Then I assembled it inside the otherwise completed RF deck but without screwing the line to the end bracket, and the end bracket to the chassis. By sliding the bracket I was able to find resonance and then I cut the additional length off the anode line and screwed it all together. There is an easy and safe way to adjust the tune and load of a VHF amplifier before powering it up. For years I struggled with High-Q VHF amplifier output circuits, it would sometimes take me days to get it right. This method made the job so much quicker and simpler and gets you very close to the optimum values and settings. With NO HT applied to the amplifier connect a non-inductive resistor of the same (or close) value directly from the anode to ground close to the grid ring using short leads. Connect an antenna analyser to the output socket of the amplifier (I borrowed a MFJ-259 but there are better ones) and adjust the line for resonance and the output coupling for 50R +j0 at 144MHz. By sweeping the antenna analyser you can see straight away if the line is too long or too short and if the output coupling is correct. Once you are close to the correct settings check the amplifier with the covers screwed down. Don't forget to remove the resistor when you are finished. When you switch on you'll be delighted to see lots of power output. At a push you can use a LOW power rig and a good SWR meter for setting up the output circuit but an antenna analyser is so much better because you can see if your line is too long or too short.. The GS31b chimney is made from PTFE sheet and attached to the lid of the case. It makes a 4CX250B with its chimney look rather small!